Humphrey Alumni Notes: Humphrey School All-class Reunion - Scholarships Due 9/1, Early Bird Reg Ends 9/15! Humphrey School All-class Reunion - Scholarships Due 9/1, Early Bird Reg Ends 9/15! 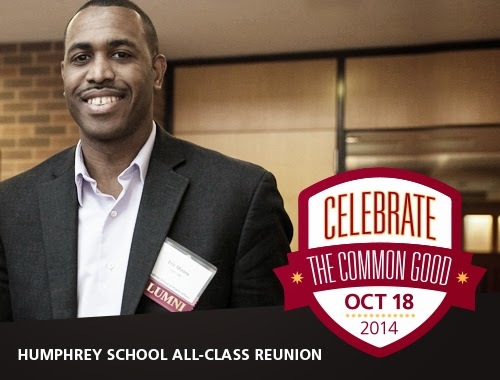 Make plans to join us for the second annual Humphrey School All-class Reunion and to "Celebrate the Common Good!" In the spirit of Humphrey, this event is designed to nourish the fire that originally brought you to the Humphrey School through thought, action, and conversation. The evening will consist of a catered dinner, social time to reconnect with your classmates, and inspiring TED-style talks from your fellow Humphrey alumni on the theme of the 'common good'. Speakers will be announced in early September. This year's Humphrey School All-class Reunion will also be held in conjunction with the University of Minnesota's Homecoming 2014 events. Be sure to plan for a weekend of fun activities with your fellow Humphrey alumni! Alumni, students, faculty, staff, and friends of the School are all invited to attend! A limited number of scholarships may be available to those who apply for support by September 1st. To apply, please fill out this form with a few sentences about why you would like to be considered for a discounted registration fee (unemployed, recent graduate, in transition, etc.). Scholarships will be in the amount of a discount for $20 off the registration fee (a total of $30 for registration will still need to be paid). Purchase your football tickets by September 2 to sit in the "Humphrey" section - limited seats available! Purchase Gopher Football tickets ONLY here. Purchase Ski-U-Mania AND Gopher Football tickets with one purchase here. If you have questions or concerns, please contact Courtney Barrette, Alumni Relations Officer at barr0396@umn.edu or 612-625-2099.